It's hot times in my house, thanks to the zillions of jalapenos that have come out of our garden. Hubzam and I pondered how to approach the task of saving the bounty of summer for the December slumps when we will be thinking about making chili and stuffed jalapenos a couple times a week. Hot food and cold weather; yep, it's a plan. Fortunately, we have a television to guide us in all our important life decisions and my Hub has teamed up, once again, with Alton Brown. Mentally, that is. We love Alton, but he is not - I repeat, not - a personal friend. We just act like he is because Alton has special powers that make us try things we have no business trying. Things like flash freezing jalapenos with dry ice in your kitchen. With the enthusiasm of a much younger couple and the cooking finesse of a toddler with plastic appliances, we chose our cutting surfaces and knives and started the prep. It was a night of peppermania, and we had Alton to guide us. Just look at that innocent, all-knowing face. Uh, dude...what's with the knives? I've portrayed you as the saint of all food mentors. You're looking a wee bit psycho here. Not to change the subject, but why is it that we can grow peppers like a werewolf grows facial hair, but I can't grow a melon in our garden to save my soul? Knowing this little bit of garden trivia about ourselves, we still planted three jalapeno plants and three larger green, red and orange peppers. We threw in a pimento, just for flash. Realistically, our pepper needs can be met with one or two plants. Just to make it interesting, we technically planted three different types of jalapenos. That stroke of genius made for some interesting dinners, since one of those plants is hot as Satan's volcanic jacuzzi and we don't know which one it is. Every time we pick peppers, we debate which pepper is the scorcher, and then we mix them up anyhow. This simple act doubles as my audition for the sequel to Dumb and Dumber; I'm almost sure I could submit a video of myself repeatedly eating a jalapeno that is too hot for the average Joe and exhibiting actual surprise that I've scorched my mouth again. Our thought process on gardening leans toward pessimism; we always think that plants will die, deer will eat them, rabbits will have a buffet or bugs will totally bug out. It doesn't happen, so I'm not sure why we are firmly and uncompromisingly in that negative mindset. Those darn jalapeno plants had more peppers than they had leaves; the other plants had a booster year, too. I've stuffed more peppers this summer than all the eastern European cooks combined. Chopping and slicing away, I noticed we both were coughing. The few IQ points I retain told me to keep my hands away from my face, eyes, lips, etc. 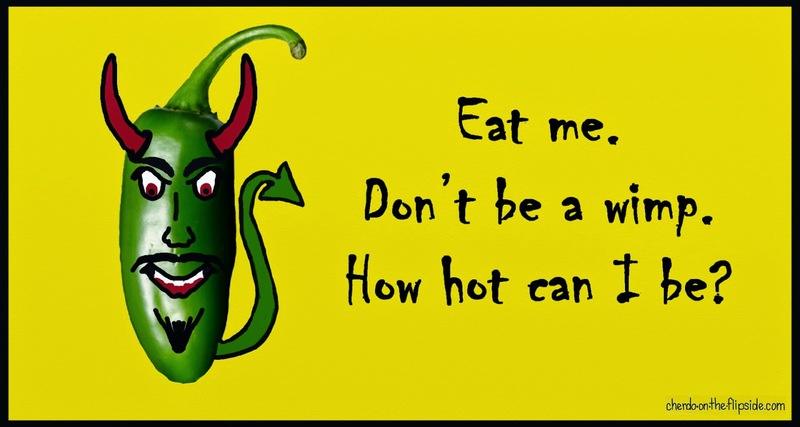 Yet, it never occurred to me that I'd be breathing in the full wrath of the pepper devil. My hands started burning and I realized that I have a lot of little cuts and abrasions on my hands, and one big ole' paper cut (ouch, where did you come from, buddy?). Yow, this is why people wear gloves, but I didn't want to wimp out with preemptive steps I poo-poo in others. Turns out - I'm an idiot. Gloves would have been a fabulous idea. Hubzam placed the newly acquired bags of dry ice in a cooler and we set a tray of prepped jalapenos on top of the ice. Twenty minutes passed, and they weren't a even a little bit cold. We had an efficacy issue here. Could it make that much difference if the ice was in the bag - or out of the bag? Apparently so. Once we cut the bag open and emptied it in the bottom, the familiar Halloweenish smokiness filled the cooler as we placed the foil covered wire tray on the ice once more. The tray let out a weirdly demonic moaning sound - no joke. Hubzam and I looked at each other and gave our best cartoonish, "what the hay?" face. Closing the lid, we crossed our fingers...our burning, inflamed, fingers. Fifteen minutes later - it worked! Frozen green slabs of spicy deliciousness, ready for the freezer. Success! Alton, you have done it again. I kiss his 8 x 10 glossy. My husband doesn't have a glossy, but I give him full props. Downside: I've washed my hands repeatedly, and even consulted my old pal, Internet, for ways to get this jalapeno juice off of my hands. Let me save you some trouble. The helpful hints are overrated. My hands are still on fire, I know that it'll end up in my eye some time...and I have to use the restroom. I'm truly fearful. This might be another opportunity to dig out those gloves. As I revealed in a post of my own, I am a familiar name on the competitive eating circuit and recently claimed the crown by consuming 3 bushels of jalapenos in 5 minutes. I later set another record by consuming 10 gallons of Alka-Seltzer in 30 seconds. Mrs. Shady has the same problem with her garden. It yields mass quantities of jalapenos, radishes and eggplant but little else. Thanks for the tips and thank you for another fun post, dear friend Cherdo. Let's make it a great week! Brother, I told you - you don't want to see me red! Ha ha. My hands are still burning, but not as bad this morning. We're having beautiful weather and I am committed to getting out in it! Let's DEFINITELY make it a good week - it's on! Cherdo, you certainly do know how to make me laugh! Yes, be very afraid (and uber careful) when you try that bathroom run; this I know from "personal" experience! Rest assured that the hot chemical in hot peppers is used in a very popular arthritis cream, meaning you won't be needing to rely on any OTC NSAID's for some time. P.S. 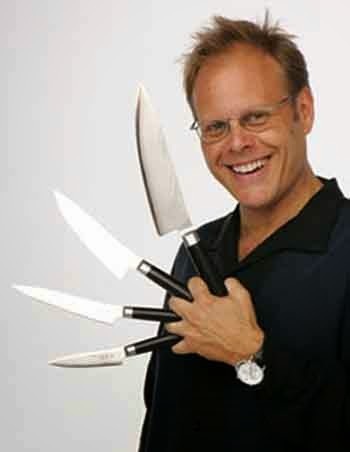 Alton Brown is my hero too!!!! I used to try to teach my anatomy classes like his show (with more or less success...turns out anatomy students don't all have a quirky sense of humor). AND!!! !- Kathy and I also did the dry ice schtick with blackberries!! Great minds really do think alike, my dear Cherdo! Congrats to your huzbam (sp?) for going that extra hand burning mile! Gary, dear Gary...great minds DO think alike, ha ha. I love Alton Brown's quirky delivery and the focus on the science of cooking. We'd definitely try it again, but perhaps with gloves, if it's hot peppers. Speaking of laughs, I can't think about you without remembering your laugh - you have a great laugh; it makes me want to laugh, too - even if I missed the punch line. While doing the lecture on heart anatomy, I'd suddenly stop and exclaim "Hey, I'm hungry. You know, I didn't get a chance to eat lunch and if it's OK with you guys I'm just going to have a light snack while I teach." I'd then clunk down a cutting board put on an apron and pull out knives like Alton Scissorhands'. I would then pull out of a cooler a pig's heart which I had packed on ice in buffered isotonic saline (bought at a slaughter house earlier in the day) and proceed to make yummy sounds! We used a pig's heart in our homeschool anatomy class, too! We're lightweights, but it definitely made them remember the lessons. Oh, that looks good...thank you, Stephanie! I've got 'em stockpiled now, might as well use 'em! IT'S EDWARD KNIFEHANDS! Call Tim Burton. It's time for another movie. Shady doesn't want to give up Chrissy (he says he spent the weekend getting in touch with his inner Chrissy; I feel so sorry for Mrs. Shady; you know he wears her undies and high heels). I'm not letting him get in my pants. ;-) My dad loved jalapenos. He kept a jar in the refrigerator. Several times each day he'd open the refrigerator to help himself to a jalapeno. Then he got sick (stomach problems) and spent about two weeks in the hospital. No more jalapenos. You can chop up a jalapeno in little pieces and make chile con queso, which I happen to love. Let me know when it's ready. Please stock up on gloves and stay out of the bathroom. I am worried about your tender lady bits. Cherdo, don't you think you should remove Janie's comment? evening gown). What can I tell ya? Sometimes "I feel pretty." Tsk, tsk, tsk...I don't remove 'em, I just laugh or shake my head and make the tsk sound. You'd look lovely in evening wear. Consider the "always classy" mink draped on your shoulders. Janie, thank you for worrying about my parts. No one considered how they feel about things. Like jalapenos, for example. Only a kind, caring friend like you would lose sleep over it. I'm touched...or not touched...but somewhere, there is a warm, friendly feeling floating around. A man and wife from La-La-Land were recently murdered by the Capsicum Gang. (I hope it wasn't you and your Significant Otter.) I know this is true because I was recently on a business trip in Jalapeno, Mexico, and the story was splashed across the headlines of all the Jalapeno Newspeppers.